Looking for a few ideas on where to stay in Key West, Florida? 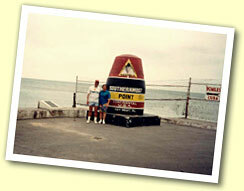 As a guide and long time resident of Key West these are a few places that I would recommend. Located at the waters edge, the Weston offers you luxury and convenience. Keeping with the Weston tradition, they have sizeable rooms that are clean, a great staff, and a fine restaurant for dining. Waterfront pick up by flats skiff on our fishing trip is possible. Located on the Key West harbor just off of Duval Street, you’re in walking distance to all the attractions and restaurant. The Conch House is a great place, nice rooms, very clean surrounding and a wonderful staff giving this place a homey atmosphere. They have a nice pool to cool you down after a day of hot fishing. A great place to just take it easy – remember its your vacation, relax. Located a few blocks from downtown and just a few block from Garrison Bight Marina. The Curry Mansion offers plenty of clean rooms with a quaint atmosphere and a friendly staff. A nice pool for your cool down after hard day of fishing with Capt. Lenny. Move at your own pace here. Located one block from downtown and in walking distance from all the island attraction. Just a short cab ride away from Garrison Bight Marina. The straightforward name at Budget Key West comes from our pricing philosophy and commitment to value. This charming, seventeen-room hotel is not at all a corporate big-box hotel as the name may imply. Classic Key West architecture will greet you along with a courteous staff and comfortable guestrooms. The hotel is well located in the historic district, just two blocks to the Key West harbor and a short walk to Duval Street. The harbor area, known locally as the Key West Bight, is the hub of many water activities including fishing charters, snorkel trips, sunset cruises, the ferry dock, and several marinas. You will find the Schooner Wharf Bar and a long list of great restaurants and entertainment venues. Keep in mind, these are just suggestions, Feel free to search for other places to stay on the island. As always, I invite you to contact me with any questions regarding your trip to Key West. By the way, please make a note and tell your local hotel reservationists that Capt. Lenny sent you.